Abstract. Intracontinental endorheic basins are key elements of source-to-sink systems as they preserve sediments eroded from the surrounding catchments. Drainage reorganization in such a basin in response to changing boundary conditions has strong implications on the sediment routing system and on landscape evolution. The Ebro and Duero basins represent two foreland basins, which developed in response to the growth of surrounding compressional orogens, the Pyrenees and the Cantabrian mountains to the north, the Iberian Ranges to the south, and the Catalan Coastal Range to the east. They were once connected as endorheic basins in the early Oligocene. By the end of the Miocene, new post-orogenic conditions led to the current setting in which the Ebro and Duero basins are flowing in opposite directions, towards the Mediterranean Sea and the Atlantic Ocean. Although these two hydrographic basins recorded a similar history, they are characterized by very different morphologic features. The Ebro basin is highly excavated, whereas relicts of the endorheic stage are very well preserved in the Duero basin. The contrasting morphological preservation of the endorheic stage represents an ideal natural laboratory to study the drivers (internal and/or external) of post-orogenic drainage divide mobility, drainage network, and landscape evolution. To that aim, we use field and map observations and we apply the χ analysis of river profiles along the divide between the Ebro and Duero drainage basins. 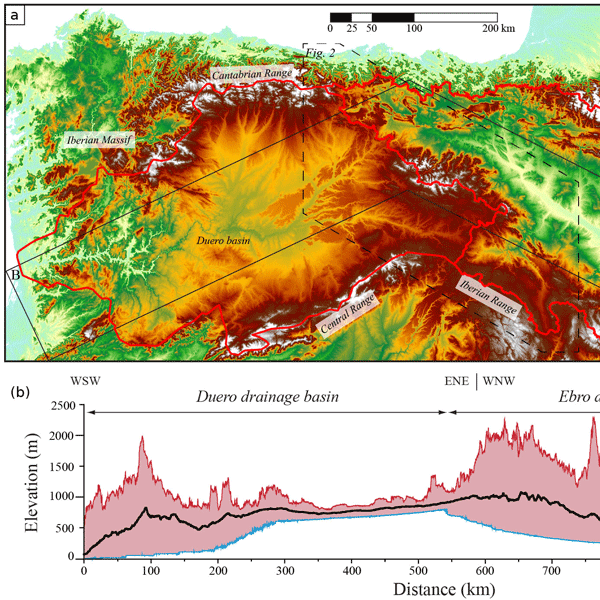 We show here that the contrasting excavation of the Ebro and Duero basins drives a reorganization of their drainage network through a series of captures, which resulted in the southwestward migration of their main drainage divide. Fluvial captures have a strong impact on drainage areas, fluxes, and their respective incision capacity. We conclude that drainage reorganization driven by the capture of the Duero basin rivers by the Ebro drainage system explains the first-order preservation of endorheic stage remnants in the Duero basin, due to drainage area loss, independently from tectonics and climate. 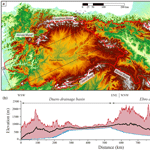 How to cite: Vacherat, A., Bonnet, S., and Mouthereau, F.: Drainage reorganization and divide migration induced by the excavation of the Ebro basin (NE Spain), Earth Surf. Dynam., 6, 369-387, https://doi.org/10.5194/esurf-6-369-2018, 2018.